I made this image the same morning as the last few images posted. 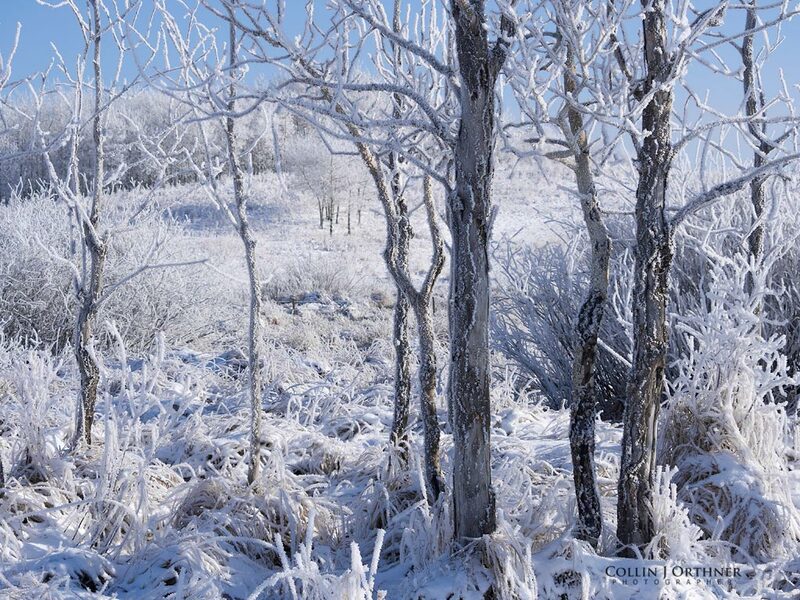 These trees lining a small slough were caked in very thick hoar frost after going through a night of ice fog. 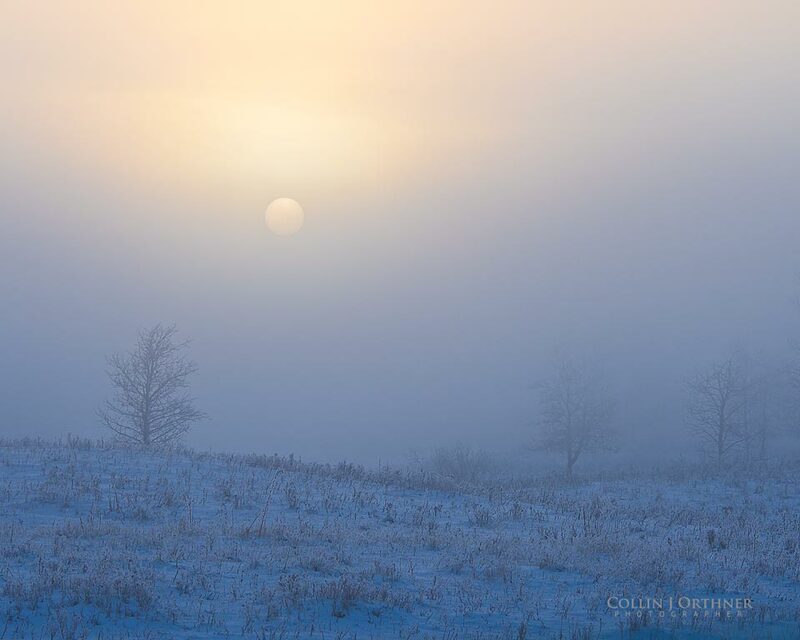 Eventually the sun burned off the fog and was shining bright and the clear blue sky added just a bit of colour. There were images to be made all around and it was a lot of fun searching out one that told the story about the morning I was enjoying. Sometimes I find it very difficult to translate what is around me into an image that tells the story of my experience. Many times the light may not be just right or I forgot to bring my cup of coffee along, but whatever the reason, some days images present themselves everywhere whereas other days I can go home empty handed. That is OK too, as I have almost always had a very enjoyable time outdoors or travelling around some backroads exploring. I used to have a very strong desire to come home with a keeper whenever I headed out, although this could be at the cost of me not being more than just an observer. 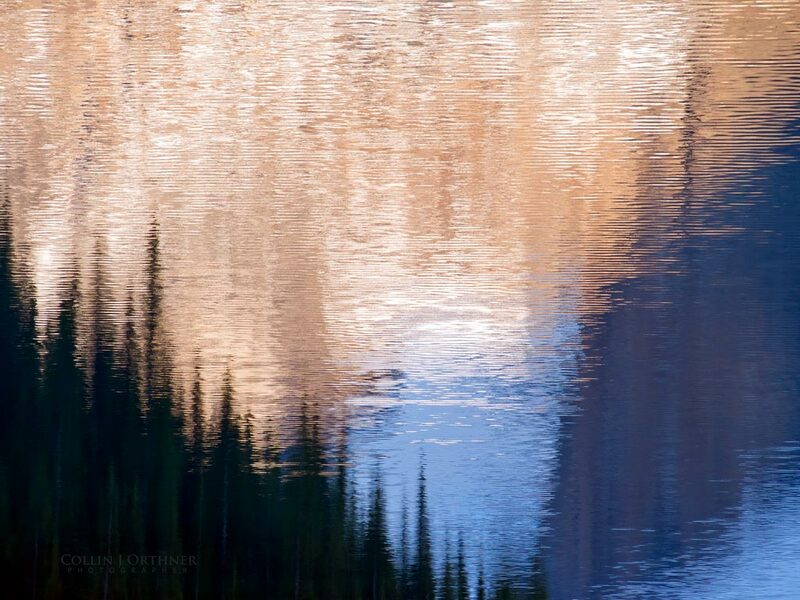 I now head out with the hope of making a beautiful image I can share with others, but also with the full intention of feeling the wind and smelling the air, experiencing where I am. The days I come home empty handed are usually those when I leave the house with a preconceived idea of what I will see and shoot instead of just observing and experiencing what is laid out before me. “Consider the life of trees. 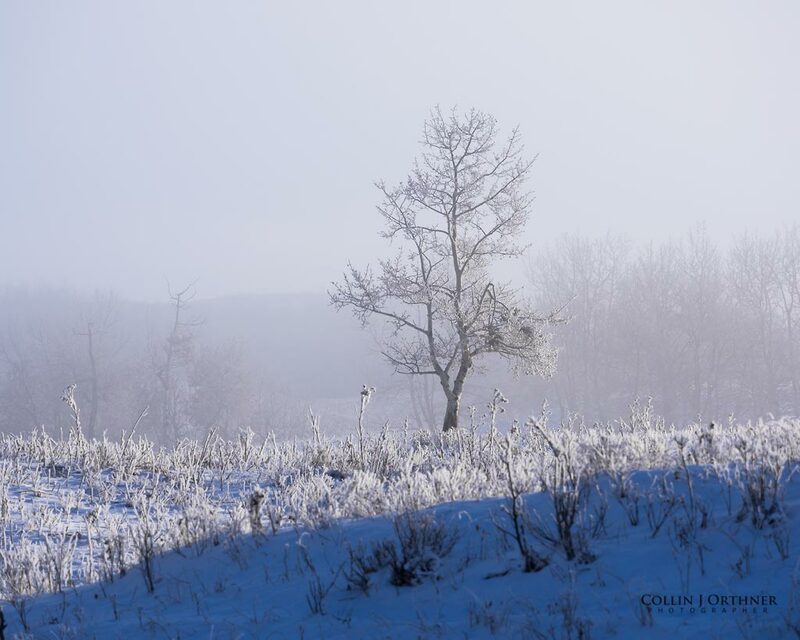 Sparkling hoarfrost being backlit by the rising sun makes for high drama on the hills east of town. I found this lonely tree full of character in the middle of a meadow and it reminded me of images I’ve seen from parts of England. Yes, a second sunrise image from yesterday. Same sunrise though, not a second one. Making sense now? Yesterday morning was so beautiful! I was out for 4 hours enjoying the changing conditions as the fog would come and go. Some places were completely sunny and another only a kilometre away were totally socked in, so it made the lighting change dramatically. It seemed quieter than usual too, so the fog must absorb some sound. 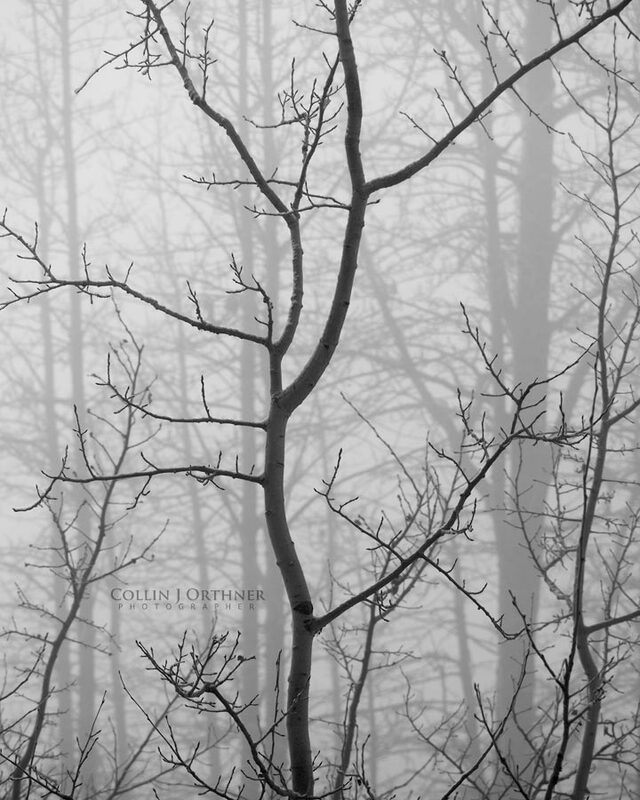 It was great to be in the midst of a thick bank of fog and just listen to the quiet. 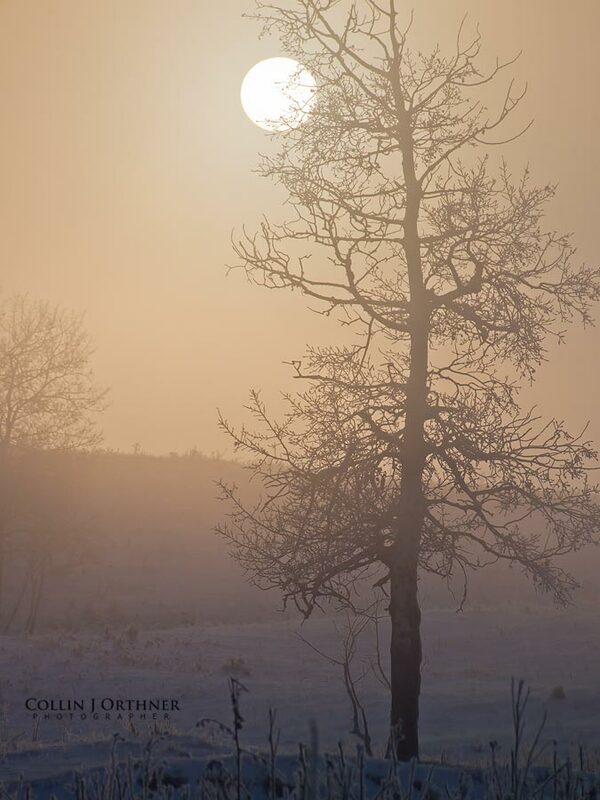 All around Red Deer County this morning was some dense patches of ice fog. It was great to watch the sun rising through the banks of fog and I quickly searched out a foreground to compliment the spectacle. 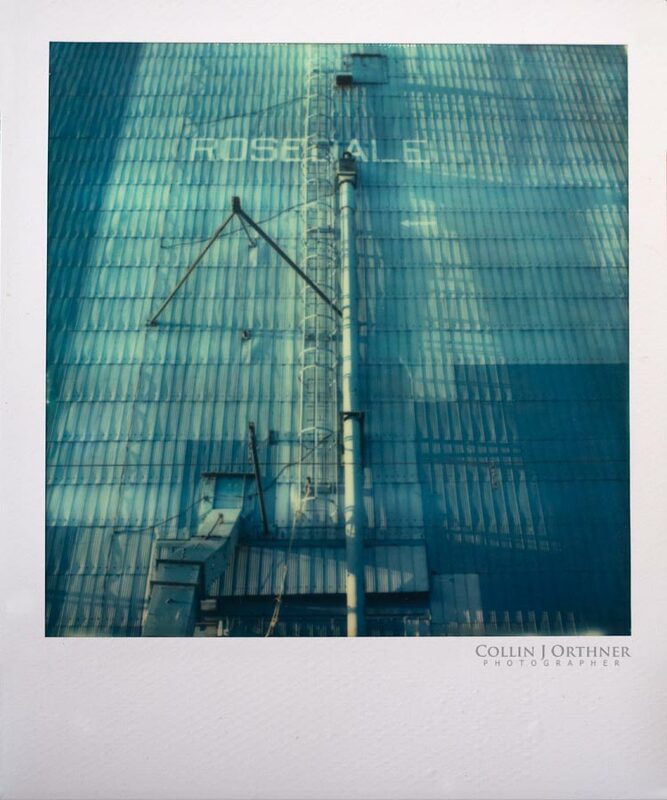 A bit of a different take on the grain elevator in Rosedale. This time using a Polaroid SX-70 camera with Impossible Project colour film. I love the gorgeous rendering of the blue/green metal siding! It was an early Saturday morning in Drumheller. I headed out before sunrise to drive around the small town of Rosedale where I spent quite a few years growing up. I also took the short drive along the Rosebud River to Wayne where you cross 11 bridges in about 7km. The sun had just cleared the valley walls and was raking across the grain elevator creating a wonderful pattern on the side. I scrambled through the ditch with my gear and set up a three image vertical stitch. I don’t think it gets used any longer as the tracks alongside are becoming grown over, unless maybe someone owns it as there own private granary I suppose. I recall the train rumbling through town every night only 30 meters from our front door. Our whole house would shake. I really enjoyed it when a train heading from Saskatoon to Calgary would sit on the siding waiting for a train travelling the other direction to pass. They would sit and idle and sometimes shuttle back and forth maybe dropping off a car or two. The sounds were fantastic! Even now I can lay on my bed listening to sound recordings of trains and I have a very distinct sensation of the building shaking as it had when I was a kid – very cool to say the least. The trains would pass through town heading west with full loads of grain and on quiet autumn nights I could hear the low rumble for as much as half an hour as the engines pulled hard on their way up the gradual slope along the Rosebud Coulee towards the west coast.